I had no idea what my story was going to be. It wasn’t that I didn’t have a plot – the problem was that I had too much plot. Every time I wrote a sentence of the one I’d decided on, the other story idea I had with these characters called to me. If I switched over to that one, I realized that I needed to write the original one. It was messy. I could not decide, and because of that, I could not write. The only thing that stopped me from giving up was hatred of editing my other project. Then I talked with another writer. I was frustrated, so it was mostly me pouring out things that annoy me about writing and him suggesting solutions. He mentioned Lord of the Rings or, more specifically, how many parts it’s written in. I realized then that it’s made up of little novellas, each similar, each interdependent, but each their separate story. I took out a piece of paper and I wrote down all my ideas. I discovered that what I needed was three distinct parts and that all of my plots could work together. I wrote out how long each part would probably be, started roughly sketching it out, and found that I had stumbled upon a really good project. The anticipated length is almost double my normal projects but by breaking it up into three novellas, it’s less intimidating. My project, once unsalvageable, has been fixed. I learned several things from this experience. 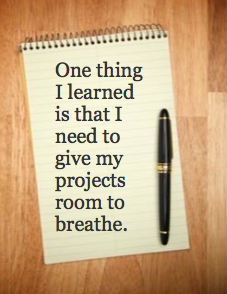 One thing that I learned is that I need to give my projects room to breathe. I wasn’t letting any of my plot ideas a chance, and it was damaging my story until I almost gave up. Another is a solution to my problem with length. Few people want to read a story that’s in the middle of a novella and a novel, but a three-part novel is acceptable. I also discovered that a community of writers is really important to the health of my writing. A couple of long years ago, I was part of a writing group, but we fell apart. I think that being able to talk about writing with someone who understands it when you talk about your writing breathing, living, and being healthy is almost essential. Now I can open my notebook and concentrate on my first plot, understanding that my second and third plot ideas will be given a chance later on. By the end of my story, I’ll have a good-sized novel and the whole tale will have been told.